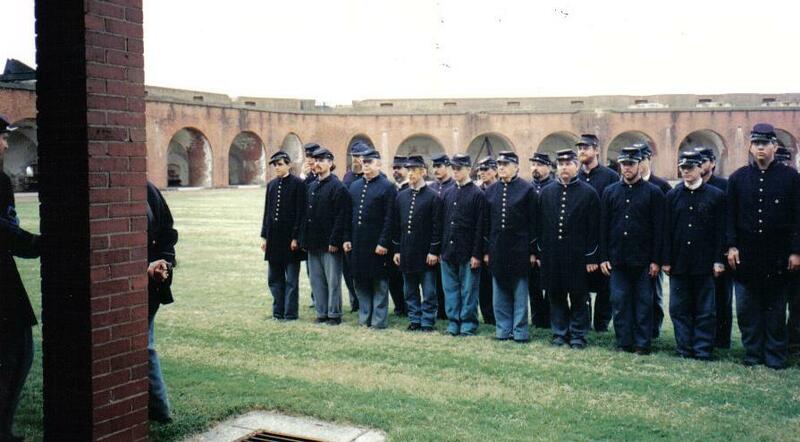 The 48th New York Regiment was involved in many battles during the Civil War, following the attack on Fort Sumter. They were a volunteer regiment made up of New York and New Jersey soldiers, but assigned to the Department of the South, fighting along the south-eastern seaboard of Virginia, North and South Carolina, Florida and Georgia. When the 48th finally returned home, they had lost over one third of their men. Andy, second from the left, marches in step with the Reactivated 48th New York Regiment. This photo was taken as the 48th were making their way to Richmond Hill. Andy's mom says this was a tough route. 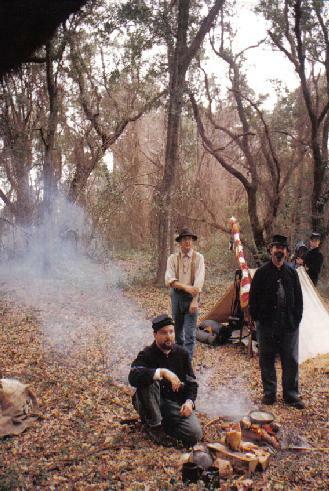 "They slogged through swamps reenacting 'Demon's March' to Savannah. They built log roads along the way. Andy had broken his right hand completely away from his arm and had just recently had the cast removed, and holding that gun was agony for him." This photo was taken during the Battle of Fort Fisher, which was the largest Naval bombardment in history. It was by capturing Fort Fisher that the Union soldiers were able to close down the last open port occupied by the Confederate Army. In this picture, you can see Andy packing his canteen. Andy wasn't able to be issued a weapon until age 16, but he was able to 'get around' that rule. "He was too young to tote and fire a 3-bander, so he did what every other boy did. He put a piece of paper in his brogan with the number 16 on it." She told me that when they asked his age, he said "I'm over 16". Andy's determination paid off. He got his musket! 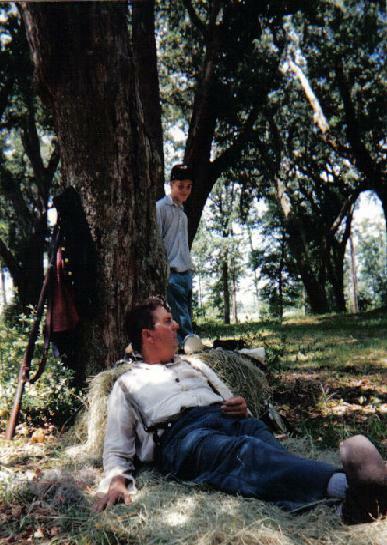 This photo was taken during the reenactment of the "Black River Raid", the very 1st battle Andy was able to actually fight in with his own issued rifle. "What initially interested me in the Civil War was the movie "Glory". I started going to reenactments, and over a period of six months, I acquired a uniform. 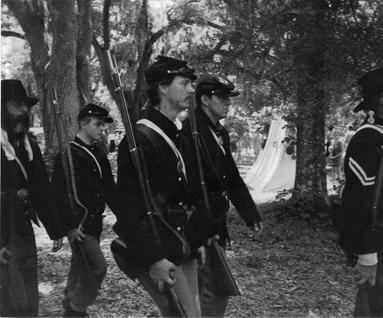 I then joined the 48th New York, a volunteer Union regiment out of Jacksonvill, Florida." Andy enjoyed the reenacting because it allowed for something different. He enjoyed helping others understand the Civil War. "I wish to educate the public about the war and the life of the soldier that went through it." At the age of 13, Andy was the youngest inductee into the 48th when he enlisted in December of 1993. Through the course of his membership, he participated in every battle reenactment the 48th New York fought during the Civil War. In 1994, Andy became a Published Poet, writing and submitting a poem he titled "The Promise", he was recognized in the "Voices of Poetry in America", in the "Fall 1994" issue. 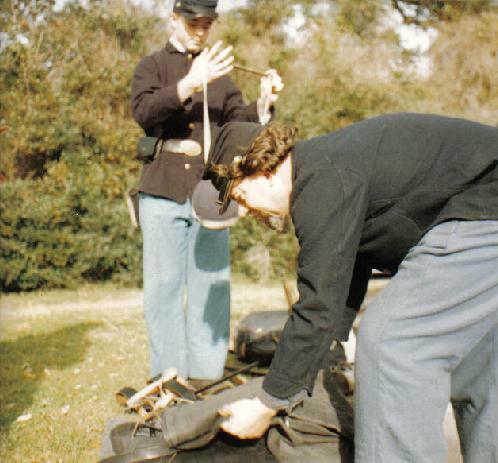 While participating in the reenactments, soldiers were "authenticated" from their clothing down to the hand-sewn buttonholes, their weaponry, three-banded black powder muskets, and even their available rations. They carried with them the same "snacks" as did the soldiers a century before. "They chewed on coffee beans and killed chickens", said Andy's mom. "It was so bitterly cold, they melted the soles of their brogans at the camp fire." "Brogans" are also called "Jefferson Booties" and are ankle boots which came into service just before the start of the Civil War. At the time of the war, most were "straight last", meaning the left shoe was identical to the right one and a soldier would have to 'break the shoe in' to fit his feet properly. Brogans have four eyelets, leather laces and square toes, with wooden pegged soles and steel heel plates to add to the length of wear on the heel. Also part of footwear was the "Gaiter", a form of canvas or leather guard laced up the lower leg to protect the pant legs from briars primarily.